In order to be confident and efficient in working in Accounting, it is useful to familiarise yourself with the following features. 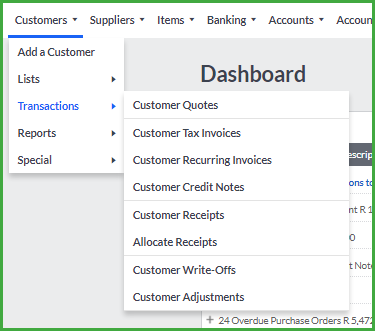 The To Do List shows due and overdue customer and supplier invoices, expiring and expired quotes and purchase orders, and overdue notes for customers, suppliers, items, accounts, bank and credit card accounts and users. The Banking widget summarises your bank account activity and gives you an option to import your bank statement. Sales History shows a graph of total sales for this year and per month. Top Customers by Sales shows the top value accounts. 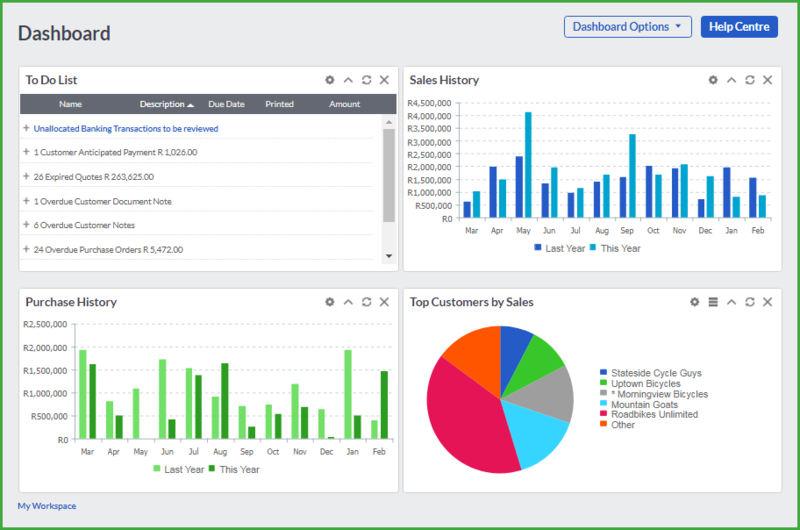 You can drill down in each element of any of the Dashboards by clicking on the graphics or the detail links. 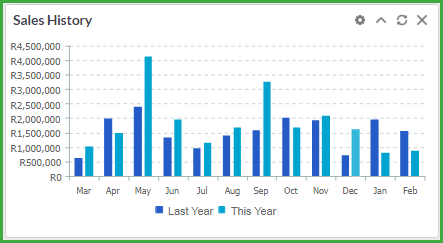 For example, if you want to view the sales transactions that make up one of the monthly figures in the Sales History graph, click on the bar in the chart to see more detail. 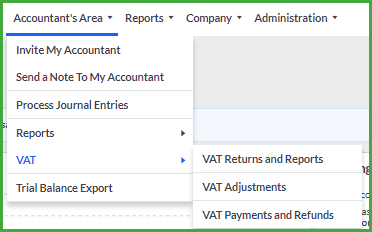 You are able to edit the different sections to include or exclude information such as returns by clicking on Edit in the header bar of each section. You can change the order of the views on the screen by clicking on the headings, and dragging and dropping them into the position that you want them in. Should you want to add more “snapshot” screens to the main Dashboard, click on Dashboard Options followed by Add Widget and select the views that you want. You can unselect views by unselecting the appropriate boxes. Save your selection when you are finished and click on Reset Dashboard to display the new view. Accounting allows you to quickly view customer, supplier, item, account and bank account information, while you are processing documents and/or transactions. In the Customers menu, you can access any function that has to do with customers. 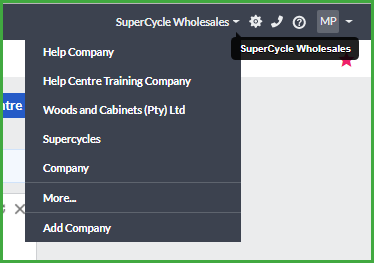 In the Suppliers menu, you can access any function that has to do with suppliers. In the Items menu, you can access any function that has to do with items. In the Banking menu, you maintain all of your bank and credit card activity as well as import bank statements. 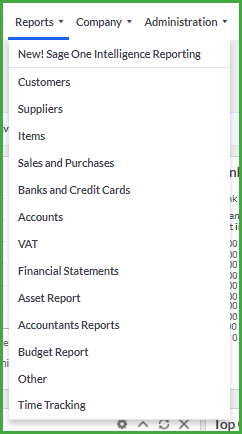 In the Accounts menu, you have options that let you enter all your operating accounts and keep track of them. In the Accountant’s Area, you will find reports and functions that are usually part of an accounting function. From this menu, you can invite your accountant, process journals, VAT transactions and print reports. 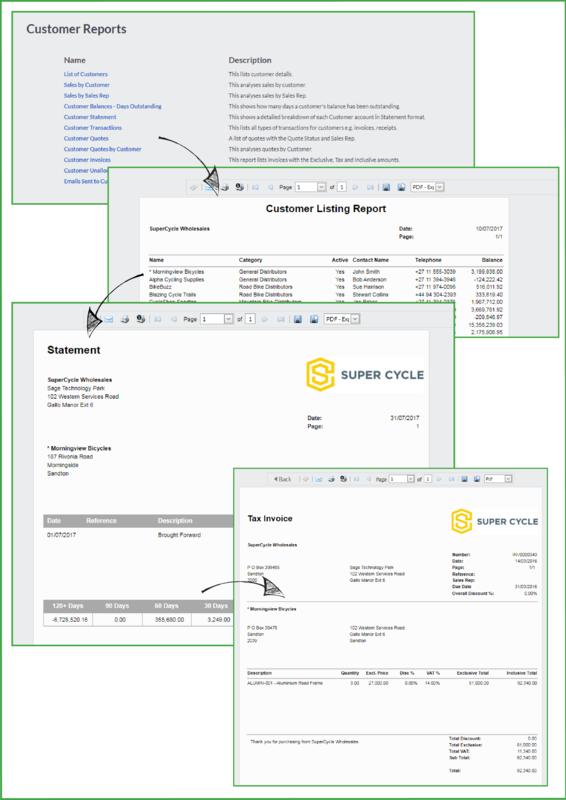 In the Reports menu, you can select a variety of reports to print. Reports can also be emailed from your company. Many of these reports are also available via the Reports section on other screens. You will add and manage your companies via the options in the Company menu. The owner menu is shown below. If you are not the owner of a company, you will only have access to the Open a Company option. The Administration menu has options that form part of an administrative function and have an effect in all of your companies. The owner menu is shown below. If you are not the owner of a company, you will only see the Change Password and Logout options. If the company that you are looking for is not displaying, you can click on the More… option to select the company. You can also add a new company from this menu by clicking on the Add Company option. 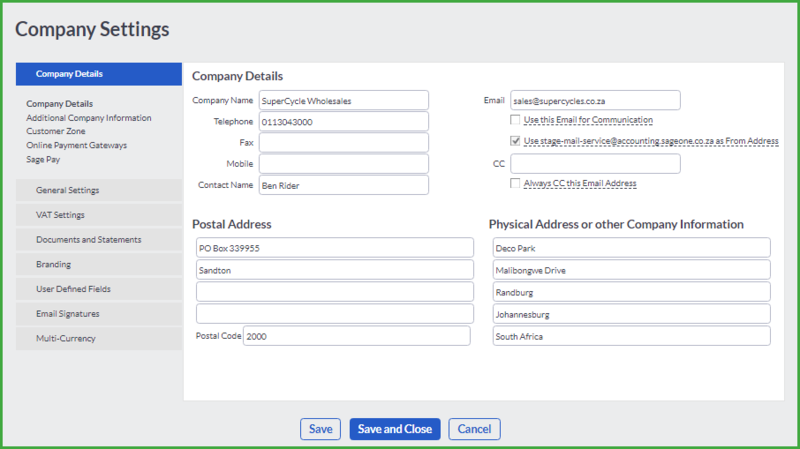 To change your company details, click on the Company Settings (Gear Icon) link. 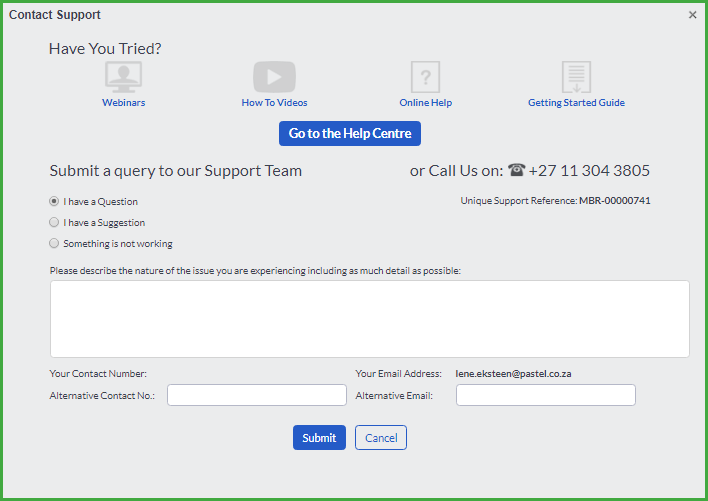 If you require help from support, click on the Contact Support (Telephone Icon) link. The Help link (Question mark Icon) opens the following screen. 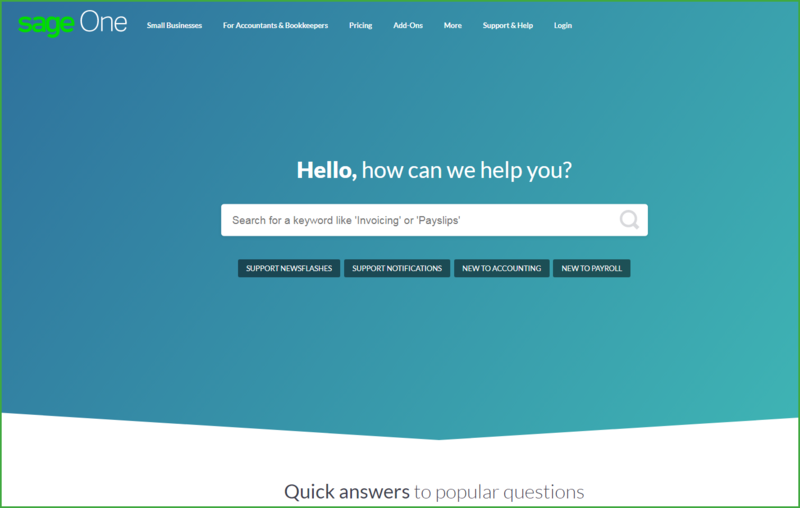 This screen assists in navigating you to the help files, an online quick reference guide as well as supply you with the necessary support information should you require support on the product. 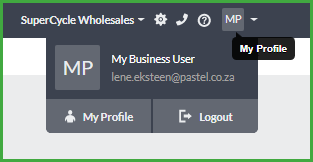 If you want to exit Accounting, you will click on the My Profile option followed by the Logout button. 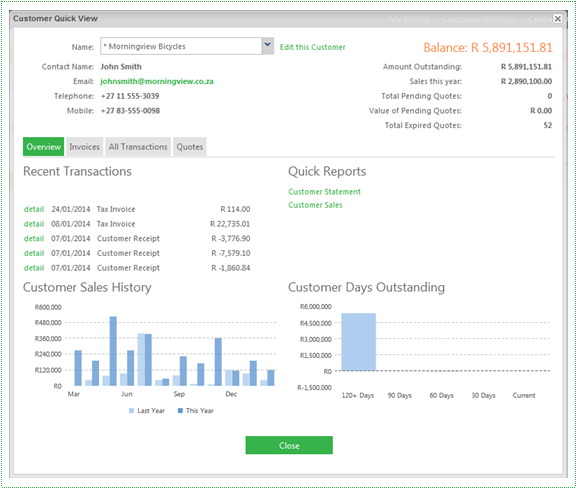 The Drill Down feature in Accounting lets you look deeper into information that is presented on the screen. This drill down functionality is available on all of the Dashboards as well as report previews. 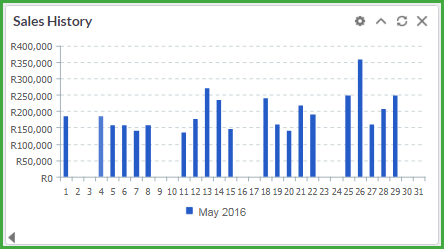 When working on any of the Dashboards, for example, you can start by viewing the Sales History graph by month. By clicking on a bar on the graph you will drill down to a daily view of the sales for the month. By drilling down once more, you can view the original invoice. Similarly, when you preview reports on the screen, the system offers drill down capabilities where possible. This enables you to view more detail about the displayed amount. For example, if you view a list of customers, you can drill down on any customer that has a balance. The drill down will take you to the customer statement, showing you all the transactions that make up the balance. 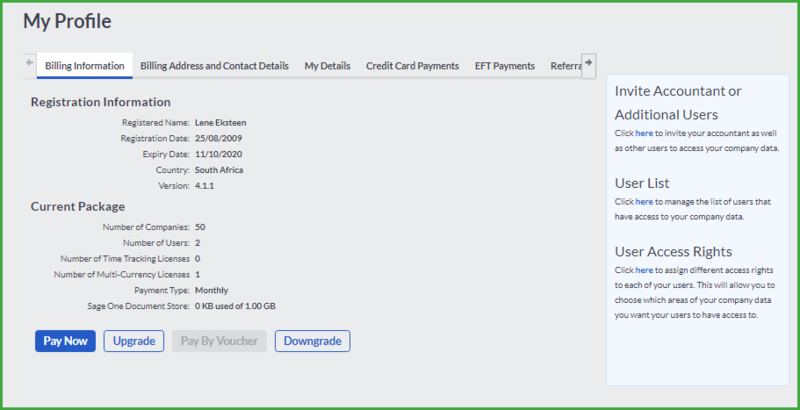 You can then drill down further by clicking on, for example, an invoice, to see the original invoice. 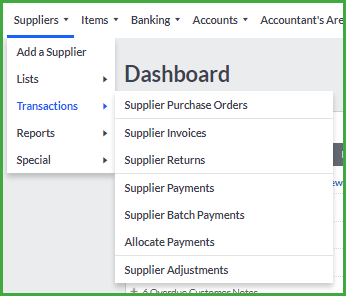 If you want to do a quick enquiry on a customer, supplier, item, bank account and/or account, Accounting allows you to perform a Quick View while you are processing documents or transactions. Drill down is a feature that lets you click on a graphic or a total and see the transactions that make up the total value. Drill down is multi-level, and takes you right down into the original transaction. The best way to explain the drill down function is via a demonstration. Here is the sales graph from the main Dashboard. Note that there is a Back arrow at the bottom left corner of the screen. You can click this button to return to the previous graph or view. You can drill down just about everywhere where you see a balance or a graph. If you are not sure whether you can drill down, just click a graph or balance and see if it works! 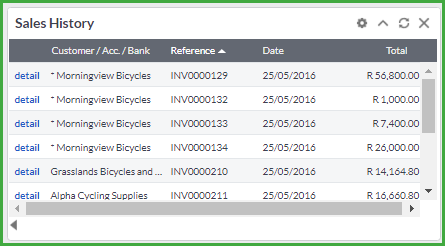 Use the Search and View fields to search for specific information on any maintenance grids in Accounting. Enter a key word or amount into the Search field and click on the magnifying glass. For more advanced searching, Accounting has default filters in the View field. Select a filter from the drop down menu and click on the magnifying glass. The search results will display in the maintenance grid. From your search results you are able to drill down to you specific information or documents. 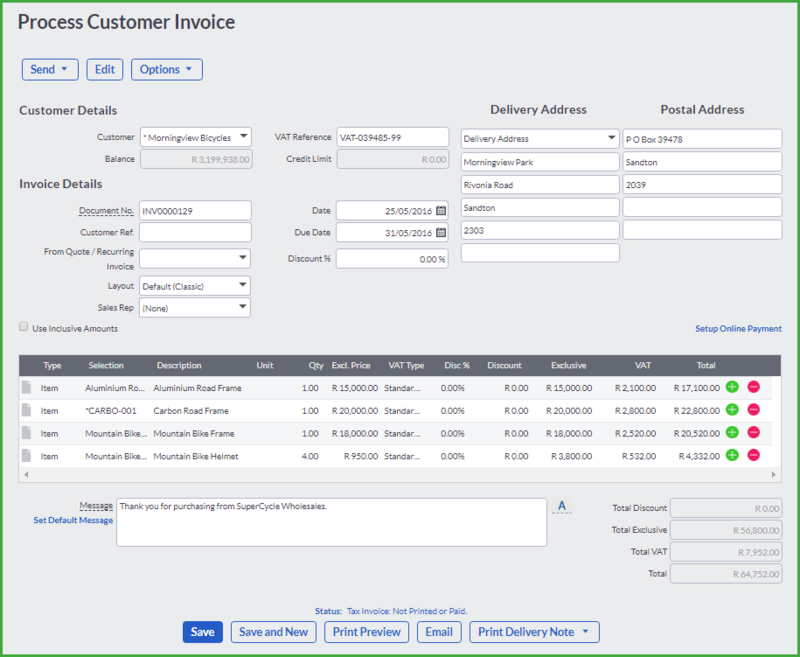 The work area, where the customers are showing in the above screen, is an area where the system displays a list of existing records, such as customers, items, invoices, and so on. The screen displays best at a minimum size of 1024 × 768, but you can use other sizes. However, it is not recommended that you use a screen setting of 800 × 600, as you will find it difficult to work in Accounting at this setting. You can print various reports related to the screen that you are in via the Quick Reports section on the screen. 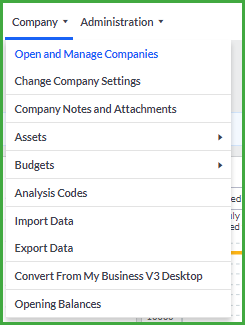 If you want to move back to the previous screen anywhere in Accounting, use the Back arrow in your browser. 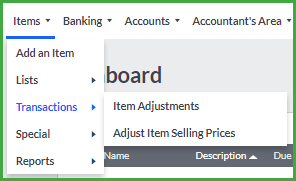 You have the option to search for any type of transaction in Accounting using the Search Transactions field. In Accounting, you will notice that the Help (Question mark icon) option has an arrow. This arrow is Help quick tips which will help you with features in the program.